“It’s news I’m most proud to proclaim, this extraordinary Message of God’s powerful plan to rescue everyone who trusts him, starting with Jews and then right on to everyone else!” Romans 1v16. Much of my website relates to issues around social justice and community action, where I expect there will be a good deal of agreement with those who do not share my faith. This I see as a positive thing because it helps create the possibility of doing something about such matters, sometimes together, as well as establishing some common ground, thus providing a springboard whereby I can point these and the folk we care about to my Lord and Saviour. I have argued that not only is the truth of the gospel and making it known important but these other issues are too – humanly speaking and from God’s point of view also. I see no incompatibility, for embracing the gospel should inspire us to serve our communities and dealing with the difficult issues that arise. I feel excited and exercised at the same time when people who disagree with my Christian views agree when it comes to matters like dealing justly with the poor. One sticking point when joining forces is obedience to God and giving Him pleasure has to be my main priority. I turn to another of my passions, the righteousness of God and its implications, in particular the need to live accordingly and preach the gospel, although to my shame I do not always hunger for righteousness as I should. Click here for ten verses in the Old Testament and here for ten verses in the New. Both show how important righteousness is from God’s perspective. While there are different emphases in the two testaments, they are entirely compatible. Many will see righteousness in moral terms or about obeying God and his laws, and both views are correct. Yet the Bible affirms that it is also about integrity, equity and justice and blessing the poor. Put most simply, it is about doing what is right, but not what is right in our own or other people’s eyes but what is right in the eyes of God, and it is a righteousness that covers and addresses all aspects of life. It is certainly not self-righteousness, for God requires from us a humble heart and contrite spirit. What matters is having righteousness imputed to us through faith in Christ. While there is often broad agreement around social matters, when it comes to the Bible message of righteousness that is generally a lot less so and, from past experience, there is often hostile reaction.Yet I contend that from God’s perspective social action and gospel proclamation are both important and connected. As a Christian (follower of Jesus) I am mandated to share the gospel with all, which is why I have produced this page. While my community activist mantra is to work with those of all faiths and none, without imposing my beliefs on any, not sharing the gospel is tantamount to me allowing people to go to their doom unwarned. I realise that besides needing righteousness imputed to us by faith in the one who died for our sins, the big challenge for us all is to live righteously. On the subject of us all being sinners, as far as God is concerned it isn’t the type of sin that matters so much, for all sin is abominable, but the sinner relies on his/her own righteousness rather than God’s and refuses to repent and submit to God’s righteousness. One of the important roles of the Holy Spirit, whose help Christians should be dependent upon for everything they do, is to “reprove the world of sin, and of righteousness, and of judgment” (John16v8), and part of the reason we are in a culture war is that many people resist and are offended by that message and react in such a way those who proclaim it suffer. While declaring the love of God is important, dealing with the matter of sin, righteousness and judgment is even more pressing as far as an unbeliever is concerned, even if this is usually less palatable to them than the message of love. Since God is righteous, he cannot allow anyone that is not righteous into his heaven, so something needs to change. I am in little doubt that when Jesus talked about the broad road that leads to destruction and the narrow road that leads to life, he knew this message would not be widely popular, although history shows us when people are at the end of their tether and have little to lose they often embrace this message, something God desires of all of us. Regarding opposition, I have no doubt that those who proclaim the message of righteousness and more significantly live accordingly, will be opposed by those outside the church and sadly some who are in it, seeking to accommodate the ways of the world. Sadly, today we see all sorts of anti-gospel teachings. It is as Jesus said: “If the world hate you, ye know that it hated me before it hated you. If ye were of the world, the world would love his own: but because ye are not of the world, but I have chosen you out of the world, therefore the world hateth you” John 15:18,19. But for those who believe, it is not merely about the things we refrain from doing but the things we do as we reach out seeking to bless a lost world, take care of a creation (this world) despite its fallenness and love our neighbour all of which those who follow Christ are compelled to do. Sadly, often the negative aspects are seen and not the positives but what ought to drive us is the practical implications of this gospel of righteousness irrespective of the revilement and ridicule we face. According to the Bible, people tend to prefer unrighteousness to righteousness and they need to turn from their unrighteousness. Many people do much good but the bar is set high and our good is not good enough. I am compelled to share the gospel with those who do not yet obey it, firstly by living out its message but also in words, albeit sensitive to the situation I find myself in. This is not done from a standpoint of moral superiority, self satisfaction or smugness or holier than thou sentiments but rather as a sinner saved by grace who struggles to overcome sin. But then as a believer I am called to overcome and to be righteous as this is how we get to please God. The reason it is important to take heed of these matters is that God has always wanted to have an eternal relationship with us but given this disparity between God’s righteous character and expectations and our own unrighteousness there is a quandary. We are in fact sinners i.e. we do not live according to God’s righteous precepts and, furthermore, however much we try to change we will remain sinners, meaning we remain separated from God. Therefore, having a relationship with Him is not possible, other than through the gospel message. “This is how much God loved the world: He gave his Son, his one and only Son. And this is why: so that no one need be destroyed; by believing in him, anyone can have a whole and lasting life” (John 3v16) is one of the best known verses in the Bible. The verses that follow though: “God didn’t go to all the trouble of sending his Son merely to point an accusing finger, telling the world how bad it was. He came to help, to put the world right again. Anyone who trusts in him is acquitted; anyone who refuses to trust him has long since been under the death sentence without knowing it. And why? Because of that person’s failure to believe in the one-of-a-kind Son of God when introduced to him. This is the crisis we’re in: God-light streamed into the world, but men and women everywhere ran for the darkness. They went for the darkness because they were not really interested in pleasing God. Everyone who makes a practice of doing evil, addicted to denial and illusion, hates God-light and won’t come near it, fearing a painful exposure. But anyone working and living in truth and reality welcomes God-light so the work can be seen for the God-work it is.” (John 3v17-21) are just as important. The good news (which is what “gospel” means) is that God has opened up a way whereby we can be saved – enjoy eternal life (as a result of our sins being forgiven), because of the gift of God’s Son (Jesus) and upon our believing (trusting in, clinging to, relying on) him, forsaking our former unrighteousness. The bad news is we suffer eternal condemnation if we do not believe. The urgency for believers is to present the gospel message to those who are unsaved and, for those who aren’t believers, to respond before it is too late. The gospel message is a simple one that can be grasped by the simplest among us, and just as equally, some of the most intelligent and sophisticated fail completely to get it. It is also a profound one that will never be fully grasped this side of eternity and it has enormous implications, such as how we view the world, how we are to respond to other people, how we are to live our lives, and importantly, where we spend eternity. It is a message that spans eternity since it goes back to the beginning of time when God had a plan and it will continue through the ages to come. It is a message of grace, which means that while we are called to righteousness, there is nothing we can do to earn our salvation. God’s grace is such that he freely bestows his best gift on those who do not deserve it. To find out what that plan is, we need to turn to the Bible, although why God should choose to create you and me we can’t fully say for sure other than to take note that he did create humankind and he did want to enjoy a loving relationship with it. As far as recorded history goes, that story begins in the Garden of Eden, when the first humans enjoyed living in paradise on earth and in perfect harmony along with their creator. When they disobeyed God by eating the forbidden fruit that relationship changed and they became estranged from God. But God still wanted to relate to his creation despite all humanity breaking his laws ever since then. Much of the Old Testament is about God relating to a particular people, the Jews, who he wanted to bless, have a special (Covenant) relationship with and be his representatives here on earth, although there is plenty of evidence he wanted to relate to the Gentiles also – before Jesus was born. He gave the Jews a law to live by, although most Christians recognize that we are only beholden to the moral aspects today, typically that which is encapsulated in the Ten Commandments. Other aspects of the law are helpful in understanding God and his purposes. When I wrote my book, “Outside the Camp”, I deliberately chose to reflect Old Testament, non moral law imagery, in particular that which related to what took place on the Day of Atonement (Yom Kippur), still celebrated by today’s Jews. What originally took place is described in Leviticus 16. The picture of the Scapegoat that appears on the cover of my book is of the goat that was released into the wilderness (outside the camp). Just prior, toward the end of the day’s rituals, the High Priest had laid his hands on the goat in order to transfer the sins of the people onto it. 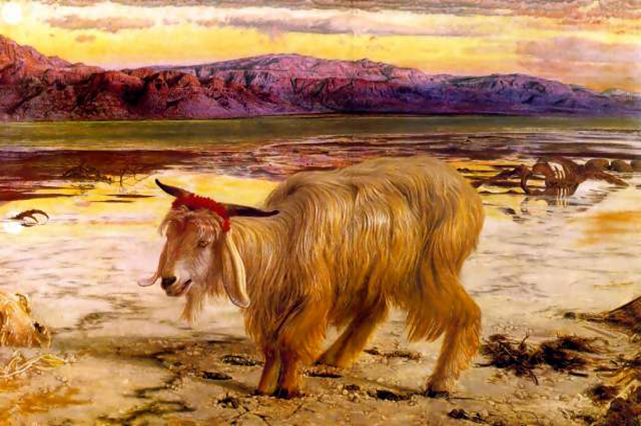 The New Testament writers made something of the notion that we who follow Jesus need to identify with him by going outside the camp, just as Jesus (our scapegoat) did, “bearing his reproach” Hebrews 13v13. There was also another goat involved in the proceedings and lots had to be cast as to what the individual roles would be. The other goat was sacrificed for the sin of the people, whose blood was sprinkled before God, upon the Mercy Seat on top of the Ark of the Covenant, in the Holy of Holies. I mention these matters for three reasons. Firstly, it ties in with my own community activist agenda, which is the principle thrust of my work and of this website. Secondly, this is a picture of what was to come and pertinently points to the essence of the gospel message: “Christ died for our sins according to the scriptures; and that he was buried, and that he rose again the third day according to the scriptures” 1Corinthians 15v3-4. Thirdly, this imagery reflects my own Christian background and heritage and the need to personally identify with Christ who can be seen both in the goat that was sacrificed and the scapegoat that was released into the wilderness. Sacrificing an animal under the Old Testament law, and there were many examples of this happening, had but a limited value, yet it showed there was a way for sinners to be reconciled with a righteous God. Such sacrifices could not take away all the sins of the people and was time limited (until the next time the people sinned). And besides which, God made it clear that he also required contrition and brokenness. Regarding sin, each and every one of us is a sinner and we thus incur the wrath of God. Because God is righteous and holy, he cannot relate to that which isn’t. The quandary we find ourselves in is that we are helpless sinners who cannot save ourselves and that we are in need of a saviour that can. But the Lord Jesus Christ, when he died on the Cross and rose again from the dead (and one day will return to this earth in triumph), is able to take away (atone for) all our sins for all time and completely save us (past, present and future). When Jesus said: “I am the way, the truth and the life” John 14v6, it was one of many unique, amazing claims he made about himself. The great Christian philosopher C.S.Lewis came to a conclusion that Jesus had to be one of only three things: liar, lunatic or Lord. We need to ask ourselves which one, and if Lord, we need to respond accordingly. Moreover, if should be stated that Jesus is perfectly human and also divine (one with the Father), because that is how he described himself. The good news is we can have our sins forgiven and can look forward to spending an eternity in God’s heaven by trusting in Jesus to save us and making him the Lord of our lives. While good works are important, as are some of the things that Christians might encourage, such as prayer and going to church, none of these can save us. Salvation is one of the central themes of the Bible and carries with it the notions of being rescued, delivered and set free. It is also to do with experiencing health, healing and wholeness. It is about the past, the present and the future. When a young boy once asked a wise bishop if he was saved, the answered came back that I have been saved (i.e. past sins have been forgiven), I am being saved (i.e. my life is being transformed in accordance with God’s purposes) and I shall be saved (when sin and sickness will be left behind and I shall be conformed to Christ’s own image). Looking back in history, we can see many great teachers, prophets and good people. But Jesus stands head and shoulders above them all, firstly because he was entirely sinless, secondly because only he can save us and thirdly because he is one with God (the only begotten Son of God). For our part, we must come to God as penitent sinners trusting in the merits of Christ alone and, when God does save us, we are (and can only be) saved by his grace alone. As Christ’s followers we are beholden to “seek first the Kingdom of God and his righteousness” Matthew 6v33, yet it is through the righteousness of Christ that is imputed to us by faith and by virtue of his atoning sacrifice that we can stand before Almighty God and enjoy the type of intimate relationship Adam had before he fell. This is in essence the gospel message. The message is for all and down the ages men and women, boys and girls, from every circumstance, culture, creed etc. have responded to its call and their lives have been transformed. I invite you to embrace this message for yourself and do so now. I was told as a young Christian that becoming a Christian will not result in my living my life on a bed of roses – and so it has turned out; but in following Christ we will be able to enjoy what is most precious: a relationship with the one who is the Way, the Truth and the Life, a life that has purpose, an eternal hope that is secure, and the ever present help of God the Holy Spirit. While the apostles are no longer with us, their doctrine is and this is included in the Bible, which we do well to study and seek to apply since it contains the message to guide our daily dealings. One secular definition of fellowship is “friendly association, especially with people who share one’s interests”. While we could apply this to joining a church, sometimes sadly people who do this are put off because they find little in the way of real fellowship. Yet joining with other Christians is important because by doing so we can encourage one another in our discipleship and are better able to serve others and tell them about Jesus. Breaking of bread is also known by other titles e.g. Eucharist, Communion and the Lords Supper. In this simple act of remembrance, we celebrate the Lord’s death through partaking of the bread and the wine, and shows our oneness in Christ. Prayer is our essential lifeline to God. We talk to him and he talks to us. We can do so secretly or as part of a public gathering. It also involves praise, confession and intercession. It is an important way to become closer to God. It is worth being reminded that God leaves us here on Earth to serve Him and through serving Him we serve others. There will be all sorts of challenges, including opposition, but Jesus has promised to always be with His followers. We should not forget that our final destination is heaven bound and there we will be with Him forever. While I was not brought up in an overtly Christian home, my parents did fear God and sent me to Sunday School, where I was taught stories from the Bible. In my teens, I went along to a Christian Youth group, called the Covenanters, and, it was when I was fifteen and at summer camp, I met God personally, and trace my becoming a Christian to that time. It was in 1966, the week the England football team won the World Cup. While my own Christian life has been a checkered one with lots of ups and downs, I can testify to the faithfulness of God and my feeble efforts to serve Him. I am as the good book says: the Lord’s unprofitable servant! When I used the example of a goat earlier when referring to Old Testament sacrifices, it was in the context of relating this to my “Outside the Camp” book. A more common example of animal sacrifices is that of sheep, or more specifically: lamb. Going right back to the beginning we find Abel sacrificing from his flock (Genesis 4) and later we find Abraham sacrificing in lieu of his son, Isaac (Genesis 22). The particularly significant example relates to the feast of the Passover, for in order to escape the judgement God was about to inflict on the firstborn of every family, the children of Israel had to sacrifice a lamb without blemish and sprinkle the blood in the door area of their homes in order to escape. At the back of the church I attended for over half my life, there is the text: “when I see the blood I will pass over you” Exodus 12:13. I was told it was placed there deliberately to remind preachers that this was one aspect of their preaching that they must not neglect. When Jesus celebrated the Passover with his disciples, just prior to his death, he gave it a new meaning: “for this is my blood of the new testament, which is shed for many for the remission of sins” Matthew 26:28, and ever since Christians have celebrated the Lords Supper (Communion) with this very act in mind. Going back to the Old Testament, we see the servant (who Christians believe refers to Jesus, despite being written 600 years before he was born) being led like a lamb to the slaughter (Isaiah 53). John the Baptist introduced Jesus by saying “behold the Lamb of God, which taketh away the sin of the world” John 1:29. When we get to the end of the Bible, in the book of Revelation, which is particularly about events yet to happen, we see the Lord Jesus Christ as the Lamb triumphant. He is the Lamb (that had been slain, i.e. on the cross) now seated on the throne, worshiped by all heaven (ch 5). He is the Lamb that in the end overcomes, King of kings and Lord of lords (ch 17). He is the Lamb that joins his waiting bride, the Church (ch 19). He is the Lamb that is at the centre in the New Jerusalem (ch 22). This is the Lamb that we honour and the one we entreat you to follow! Some folk who read thus far may point out, quite reasonably, that my urging them to accept the gospel message is pointless if it isn’t true or can’t be proved to be true. I am sympathetic to such a position and have long ago gone on record as saying my being a committed Christian would be a waste of time and effort if that were the case. Yet the issues are so important they mustn’t be dodged. I recognize four non-Christian categories (maybe there are others): the nominal Christian i.e. one not truly following Christ despite taking upon him(her)self the label: Christian, the atheist and agnostic, the follower of another religion and the follower of no religion in particular yet who believes there is a spiritual dimension. I have addressed all four of these audiences in my book “Theological musings” available via the Writings tab of this website. While opening up the subject, proving the case for the truth of the Christian message cannot be done in the few paragraphs we have here, we can at least begin. It is not that I wish to dodge the issue and indeed I am instructed to “be ready always to give an answer to every man that asketh you a reason of the hope that is in you with meekness and fear”, 1Peter2:15. I have spent many hours debating these matters with honest enquirers (and some less honest, who just like to bait, place red herrings in the way or merely argue for the sake of it) and am prepared to do so again. I am mindful that there are those who rightly point out that there may be many who purport to having the truth who do not live accordingly, to which my response is invariably that what matters is the truth itself and of course we need to live in the light of that truth. I have heard it said that goodness and kindness is just as likely to be found in the local pub as in the local church. Whether or not this is true is not all that relevant. There are some who say that religion is important but it doesn’t matter which as they all lead to God; without knocking non-Christian religions, that is not true because the issue is truth, absolute, not relative. I do recognize the need to exercise faith in the unseen, which in fact is what we all do every day of our lives, from when we get up and press the light switch expecting the light to come on or check the sun has risen. The faith I’m talking about is reasonable as it is based on physical reality and evidence that stands up to scrutiny. It is where the subject of Christian apologetics comes into play. Books I have found helpful are those by C.S.Lewis: “Miracles” and “Mere Christianity” and Frank Morrison’s: “Who moved the stone” and there are undoubtedly many others. Two websites that contain lots of helpful resources concerning this subject, some of which are free, are: Reasonable Faith and that of the Christian apologist: Josh McDowell. The bottom line as I see it is that while faith is important in religious matters, as it is in any number of areas which touch our lives, the faith I am talking about is based on fact and is the truth. I did think about using my website to give my own multi-media presentation on the essential gospel message but, given there is so much that is in the public domain that is helpful, I have instead decided to refer to some of those resources. I would say that I am old and a bit old fashioned and, even though the essence of the gospel message has not changed over 2000 years, its application is ever new and relevant to every aspect of modern life. Click here for an online Bible (you can select your version – I often use King James but a modern version like Good News may serve you better). If you are going to read the Bible, it may be best to start with the Gospels e.g. Mark. There are plenty of other links to dictionaries and commentaries etc. You can also listen to the whole of the Bible being read. If you do an Internet search on something like “gospel presentations” you will get a number of hits, some of which are helpful. I found this one helpfully covered the basics.There is a lot of Christian preaching also on the Internet; some helpful, some less so. Obviously, reading the Bible is a good place to start, particularly one of the four gospels, since these recount the story of Jesus life and death, his works and his teachings. It is good to read a daily portion and there are many helpful reading aids.The books that I have found especially helpful, which can be purchased online or via a bookshop or borrowed from the local library, when finding out what the gospel is all about, are: “Mere Christianity” by C.S.Lewis and “Basic Christianity” by John Stott. One useful smaller book that gives a graphical presentation of the gospel message is: “Journey into Life” by Norman Warren. Reading the biographies of various Christians down the ages can also be inspirational. There exists Southend Christian Bookshop, where you can get hold of Bibles, and helpful books and other aids that relate to the gospel. Obviously, the situation elsewhere will vary from place to place but there are plenty of outlets for getting hold of Christian literature, including online, and there are many who would love to assist you. There will likely be churches that proclaim the gospel message near you. While some do so more effectively than others, some are more welcoming that others and some may present a better testimony than others, it is worth persisting in order that you will find for yourself the greatest treasure you will ever find, and having found a church it may help you on your journey and you may help others. In becoming a Christian, you will find a friend who will never leave or forsake you, even amidst inevitable trials and tribulations, but the Christian life is not to be lived in isolation but rather in fellowship with other Christians and, along with prayer and studying the Bible, you are meant to grow spiritually. Finally, the gospel message is not to be kept to yourself; it is the good news to be shared with others.